The Solarbotics Sumovore is a great entry-level kit that can serve as an exciting introduction to the world of mini robot sumo and robotics. The Sumovore is mainly designed for mini sumo competitions, but it also includes a bonus line following mode so you can enter it in line-following contests, too. No programming is necessary because the Sumovore doesn’t use a microcontroller. Instead, it uses a discrete "brainboard" made up of analog circuits to control it’s motions. However, if you want the ability to program your bot, upgrading to a microcontroller brain is possible (see Expansion Capabilities). 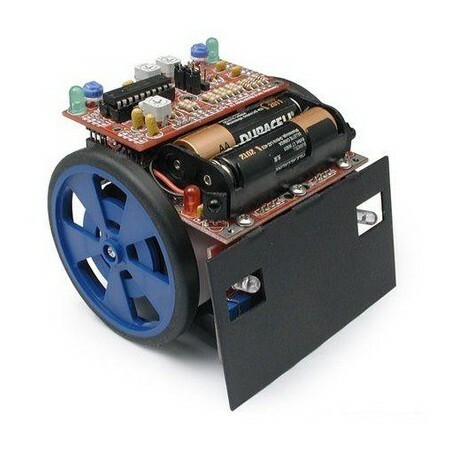 The Sumovore sumo robot features two obstacle-detecting sensors on its front (for detecting your opponent) and four reflectance sensors on its bottom (for sensing the edges of the ring, and for line following). The GM8 gearmotors give the robot more speed than competing products that use modified-RC-servos, and the robot has outperformed other stock mini-sumo robots including programmable robots. Note: The Solarbotics Sumovore robot is a kit that requires soldering; before using it, you will need to assemble the robot. Six AA batteries are required but not included. Wheel and front scoop colors may vary from the picture shown. 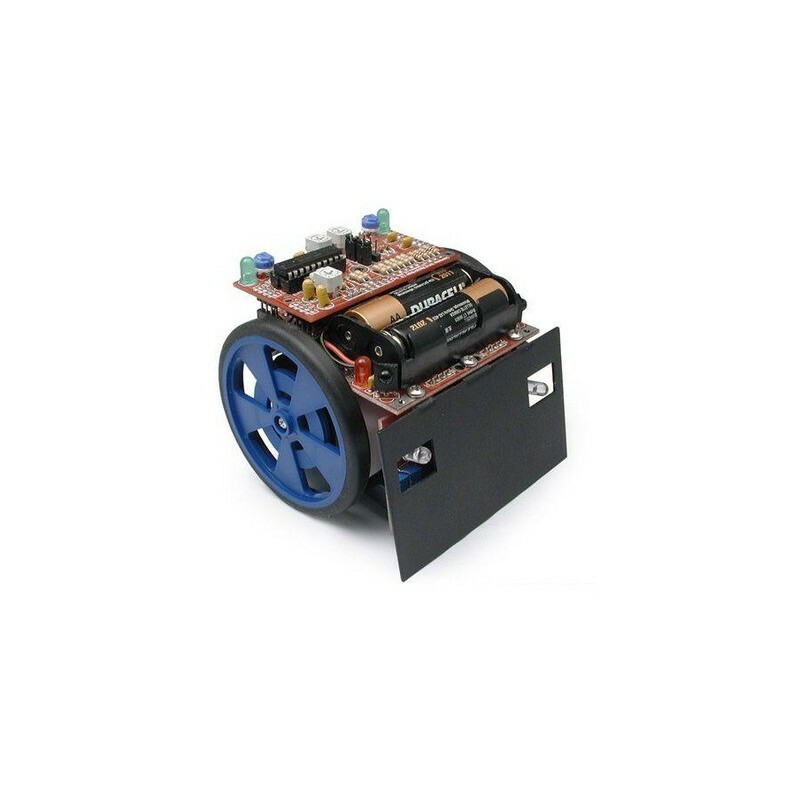 Powerful GM8 gearmotors powered by a robust L293D motor driver. Four opto-reflector edge sensors (fifth edge sensor position available when using microprocessor brainboard). Two 38kHz IR emitters and detectors for opponent detection. 6 AA power supply (batteries not included). Steel frame for easy assembly. Discrete brainboard, no programming required (optional modular brain boards for programming the robot are available). "Anti sumo-dance" behavior (stops two sumos from spinning around each other). "Anti edge-ram" behavior (stops dual edge triggers resulting in repeated edge-charging). Multiple trimpots for simple behavior tuning. Modular front edge sensor / IR transmitter daughterboard. 345 grams (0.76 lbs.) with batteries in (6 x AA batteries not included). 32-page beginner-friendly detailed instructions (2MB pdf) (includes full electronic schematics, both logical and symbolic, for custom modification). There is an optional rear obstacle sensor so your Sumovore can protect itself from an attack from behind. The Sumovore’s included discrete brainboard is detachable, so if you’re ready for an upgrade you can replace the analog brain with your own microcontroller system or one of several optional microcontroller carrier boards (see page 30 of the instructions (2MB pdf)). Once the Sumovore is equipped with a programmable brain, a fifth reflectance sensor can be added, which is useful for developing a superior line following robot. Replace the included RM3 motor with the RM2 to triple the speed and double the torque. Gain some added traction in competition with high-traction tires.